FIND THE MISTAKES AND CORRECT THE SENTENCES. a) Amanda is going to her friend’s house this weekend. b) Amanda visits her grandma every Sunday. c) Christina is going to her uncle’s wedding. d) Christina is happy about her weekend. e) Christina goes to weddings three times a week. f) Christina likes wearing dresses. Do you like wearing different clothes for special occasions? Is it good to have lots of cousins? Why/Why not? a) Amanda is going to her grandma’s house this weekend. 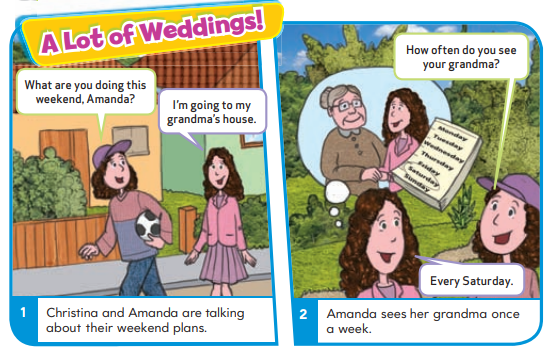 b) Amanda visits her grandma every Saturday. 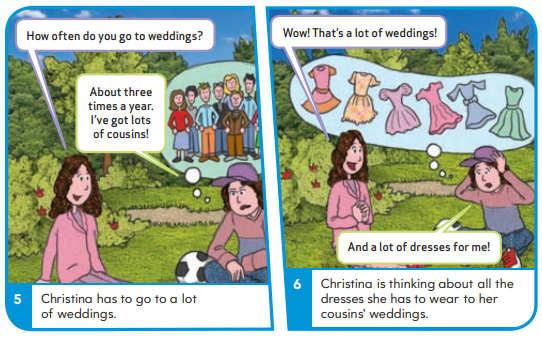 c) Christina is going to her cousin’s wedding. d) Christina isn’t happy about her weekend. e) Christina goes to weddings three times a year. f) Christina doesn’t like wearing dresses. Christina and Amanda talk about their weekend plans. 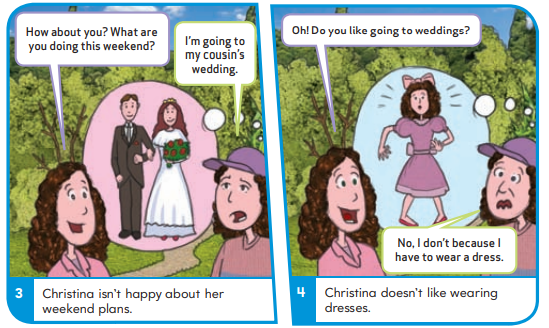 Christina has to go to her cousin’s wedding and she isn’t happy about it. She doesn’t like wearing dresses and she has to go to weddings three times a year because she has so many cousins.